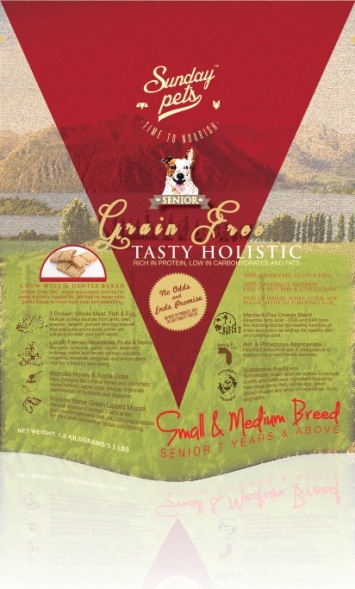 Sunday Pets are a New Zealand company, with their food being available here in Australia. It’s quite unique as they use a slow baking process at a lower heat which should maintain nutrients and moisture. 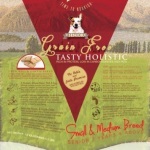 The food is grain free, which is good to see for those with allergy-prone dogs. It’s labelled as “tasty”, but that’s merely a marketing word for something your dog would have to decide. It’s a high protein food at 39%, which makes sense as the top 3 ingredients are meat and fish. It’s nice to see they show percentages for each ingredient – something that other manufacturers won’t disclose. The main ingredient, meat & meal constitutes 79% of the food – that’s much more meat than you’ll find in many other foods. What bothers me is “meat” can be anything. I’d much rather they disclosed what kind of meat, as this is largely open to interpretation – it could be any kind of animal and possibly is. I queried this with Sunday Pets and they replied saying it was comprised of lamb off-cuts (which could otherwise be labelled as by-products). Lamb is considered a food that can lead to copper toxicity. As Sunday Pets has a very high lamb content it could be worth rotating this with another food. Otherwise I wouldn’t be overly concerned. Fish meal is another undisclosed ingredient and could be of varying quality. It’s good to see a range of fruits and vegetables, flaxseed for a healthy coat and source of omega 3. There’s no oil in the food, so I have to assume sufficient omega fats are provided by the fish and meat meals. It’s very difficult to rate this food with the quality of ingredients largely open to speculation. I’ll give it 4 stars as I can’t overlook the amount of meat in the food, off-cuts or not. High protein from meat ingredients ensures there’s more meat in this food than most. Meat & Meal(min 79%) including Meat & Bone Meal, Free Range Lamb, Fish Meal. Vegetables(min 10%) including Potato, Carrot, Pumpkin, Celery, Fruits(min 3.5%) including Apple, Blueberry. Egg(min 1%), Apple Cider Vinegar(min 0.6%), Manuka Honey(min 0.6%), Green Lip Mussel(min 0.3%), Kelp(min 0.15%). Flaxseed(min 0.1%), Fennel(min 0.06%), Molasses. Nutritional Additives: Vitamins- Vitamin A 15 kIU/kg, Vitamin D3 2 kIU/kg, Vitamin E 400 IU/kg, Vitamin B1 0.9 mg/kg, Vitamin B12 0.5 mg/kg, Thiamine (Vitamin B1) 50mg/kg. Riboflavin (Vitamin B2) 45 mg/kg, Niacin 450 mg/kg, Pantothenic Acid (Vitamin B5) 50 mg/kg, Pyridoxine (Vitamin B6) 38 mg/kg, Biotin 1 mg/kg, Folic Acid 5.2 mg/kg, Choline 2700 mg/kg Ascorbic Acid 55 mg/kg. Minerals- Magnesium 0.1%, Manganese 27 mg/kg, Potassium Carbonate, Cobalt 0.47 mg/kg, Selenium 0.9 mg/kg, Iron 240 mg/kg, Zinc 200 mg/kg, Copper 26 mg/kg, Iodine 1.8 mg/kg.